UPDATE: I added my GPS track to MotionBased. It came out a little shorter than actual distance. See it Here. I also uploaded a map of the course below the post. 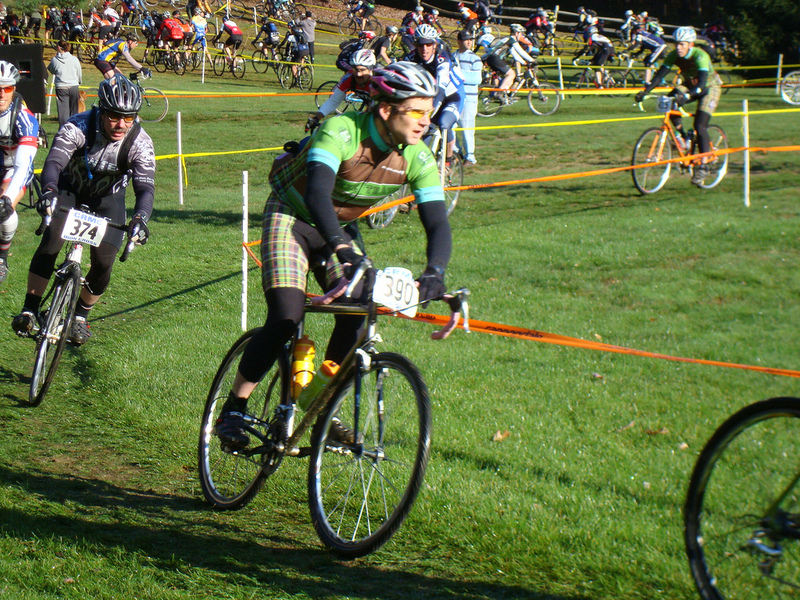 I just got back from the Iron Cross VII cyclocross/expedition race in the Michaux State Forest. Bright sun and trees bursting with red and orange leaves made for a perfect fall day. This was my second year at IC, and I posted the same time as last year, a barely-sub-six-hour 5:50 for 62.5 miles. Powerlines Hike. I Only Fell Down Twice. See photos by me from the course and scores of shots from the start & finish by MG at my Iron Cross VII Flickr page. I don’t ride singletrack more than once or twice a year, and this is my only race of the year, so I know that I’m mostly there for the challenge and scenery. The course features miles of difficult singletrack with big rocks, roots, creek crossings and unrideable hikes up steep inclines. 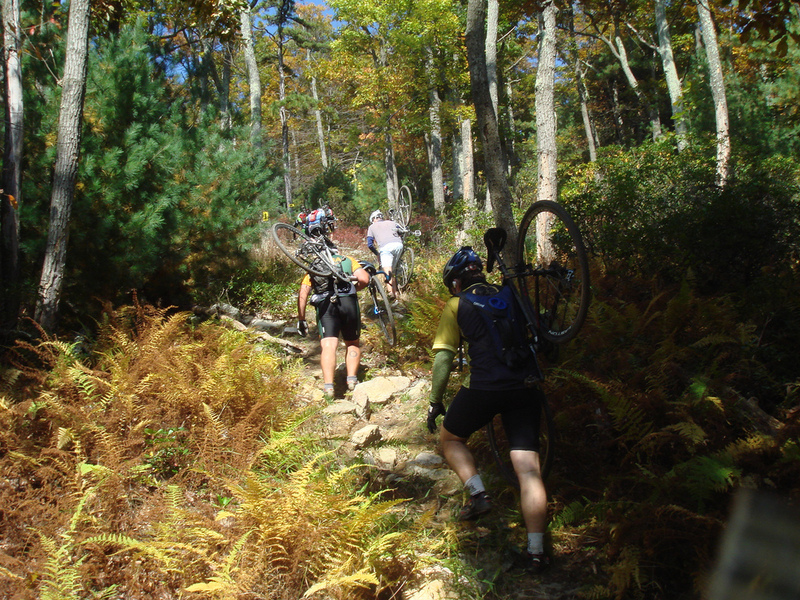 Overall, riders are either crawling up long grades — think Shippensburg Road — or careening downward on sketchy gravel and winding singletrack. The granny gear and big ring got a good workout. After flailing through the singletrack last year on a cyclocross bike with 32mm tires, this year I went to the other end of the rubber spectrum and rode my rigid Rawland dSogn 650b mountain bike with 58mm Pacenti Neo-Moto tires — and a sprung Brooks Flyer saddle. There were only a few of us out there with big tires, and just one other bike with a sprung saddle. This combination did not make me any faster, but I stayed on the bike for most of the singletrack and enjoyed the course much more. The tires rolled well enough on pavement and gripped like mad on dirt hardpack, while letting me plow over rocks and roots most of the time. I had a blast flying down the gravel roads, knowing I could bomb over the rocky bumps. All that said, I’m beat. This is a tough ride for a non-racer. By mile 50, I was starting to wonder what I was thinking when I entered. 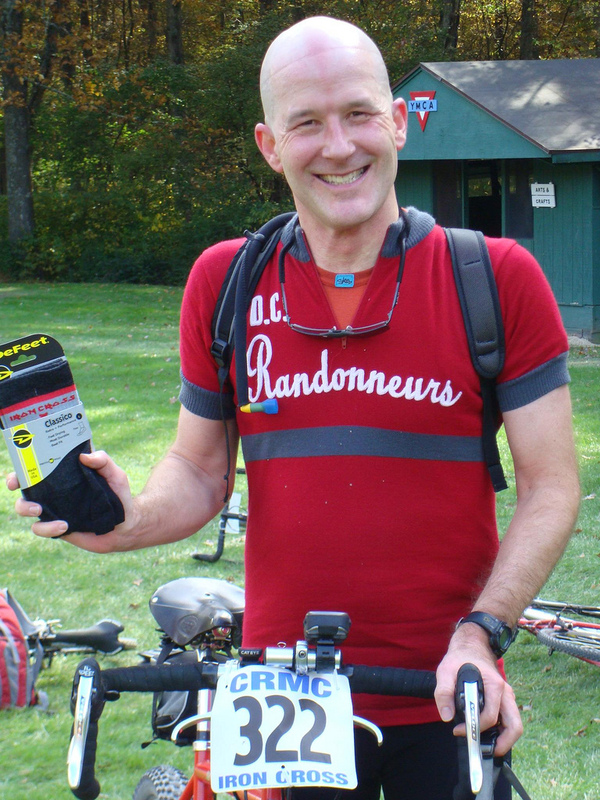 The satisfaction at the end, however, is not unlike the feeling of finishing a super-hilly brevet. And, finishers get wool socks! Thanks to Yellow Breeches racing and all the volunteers for another fine edition. See you next year! That looks very cool. It combines my two favorite aspects of cycling: cyclocross and long-distance. Though, I can’t claim expertise in either, they are my main interests. I have a Rawland cSogn frameset. After reading the geometry information, I opted for the small size. When it arrived, it seemed much smaller than what I had anticipated, sadly. It was also the last of the Sogn frames they had and was non-returnable. I have an extra 650b wheelset and a pair of Quasi-motos I might put on it, to “mock up” the bike and see how high it sits on them. Yo Todd – you selling the Rawland cSogn frameset? Let me know if it’s a possibility. thanks! Congratulations, Ed! It sounds and looks like a fun challenge. Congrats on your recent mega ‘cross experience – Well Done! Jeff & Branson: thanks guys. Join me next year?